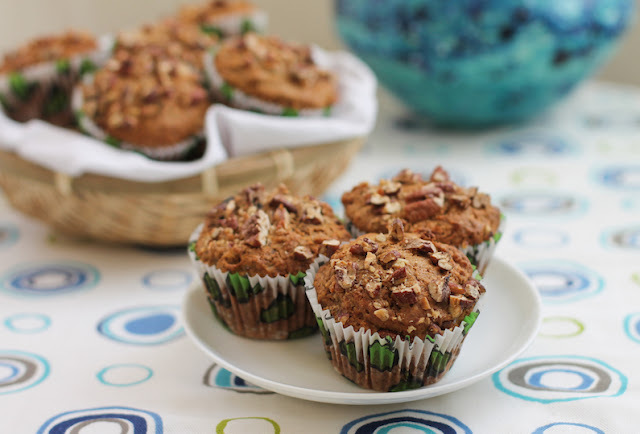 Made with thick homemade applesauce, these country applesauce pecan muffins are rich with the flavors of brown sugar and cinnamon. 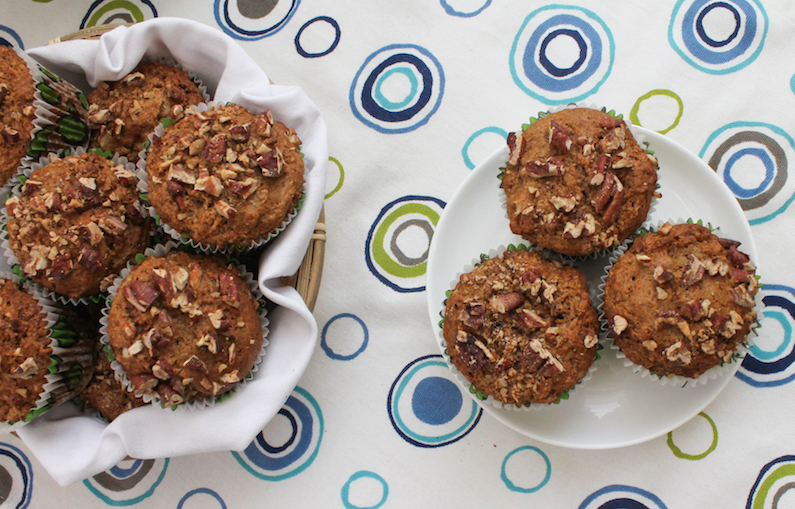 They are a great breakfast muffin or afternoon snack. Weekend before last, ahead of a routine test on Monday, my husband was instructed to start on a soft food diet. We headed to our big hypermarket for a shopping trip, picking up clear soups and other tasty morsels he could eat. “How about applesauce?” he said. “Sure,’ I replied. I turned back towards the fresh produce, as he turned toward the cans and jars. We both stopped. “We are not going to buy applesauce!” I exclaimed. “You know how easy it is to make applesauce!” Plus, I pointed out, we were having pork chops for dinner – his last solid meal for a couple of days - so we’d need applesauce for those as well. Sure, it takes a while to peel and core the apples (and toss them in a little fresh lemon juice), but you know exactly what you get when you are done. Pure applesauce, with a hint of lemon. If you choose your apples wisely, you don’t need to add sugar. Put the juice of one small lemon in a large mixing bowl. Peel, core and chop 3 Granny Smith apples and four Red Delicious, tossing the chunks in the lemon juice to stop them turning brown. 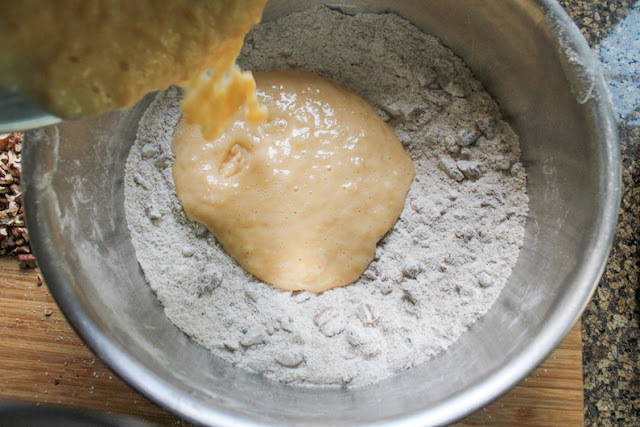 Place the lot in a heavy saucepan with 1/4 cup or 60ml water. Keep the fire on medium low and cover the pot with a tightfitting lid. Check it often, stirring the apples when you do. Cook until the apples are very soft and can be mashed easily with the back of a spoon. Taste the applesauce and add a little sugar, if necessary. 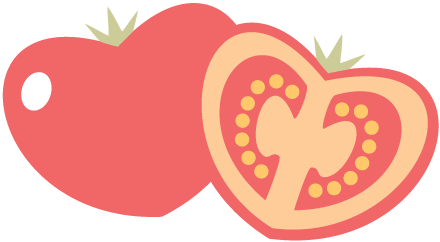 Store in the refrigerator for up to two weeks. Preheat your oven to 350°F or 180C°. 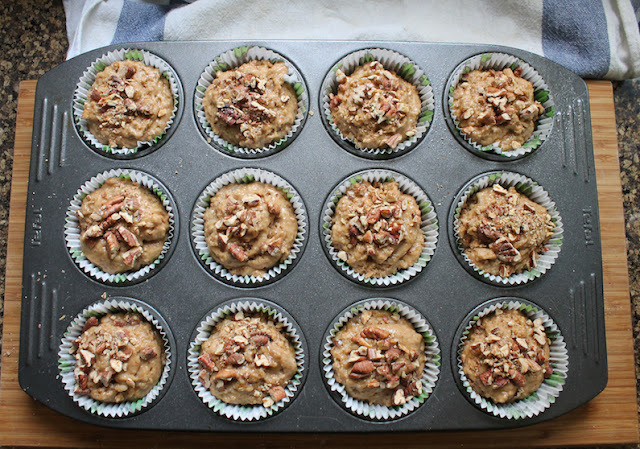 Toast the pecans on a dry baking pan as the oven preheats. 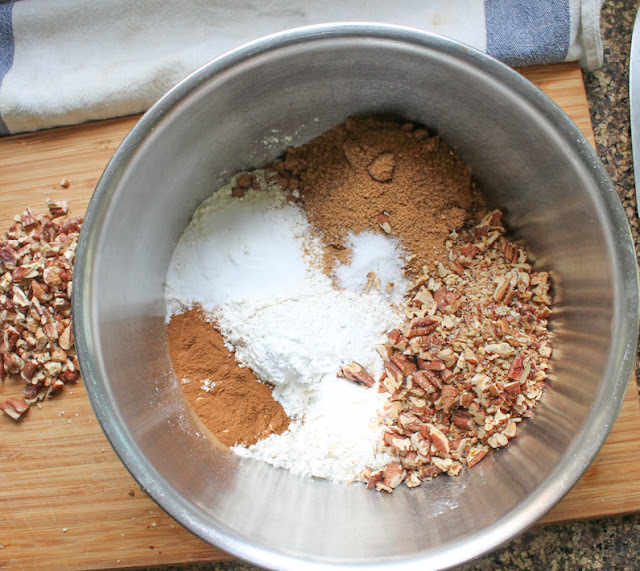 Watch them closely and shake the pan occasionally so the pecans don’t scorch. This won’t take long. Remove from the oven and chop coarsely. Grease 12 standard muffin cups with a little canola or line the pan with paper liners. 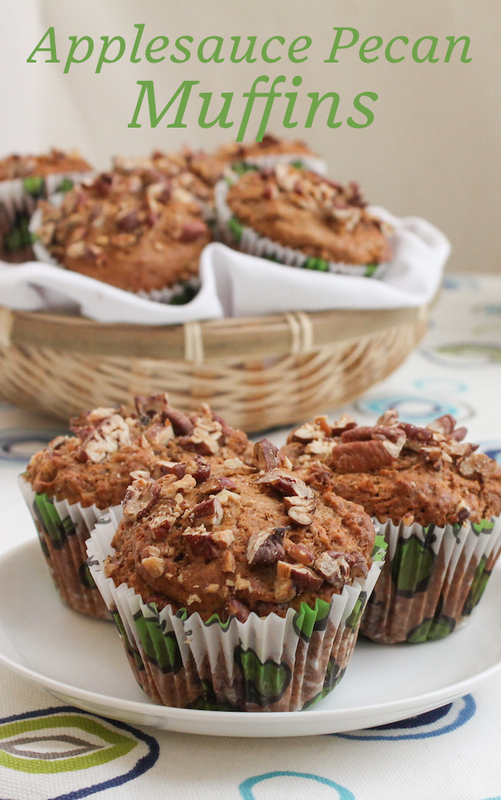 Divide the chopped pecans, setting aside a generous handful to sprinkle on the muffins before baking. 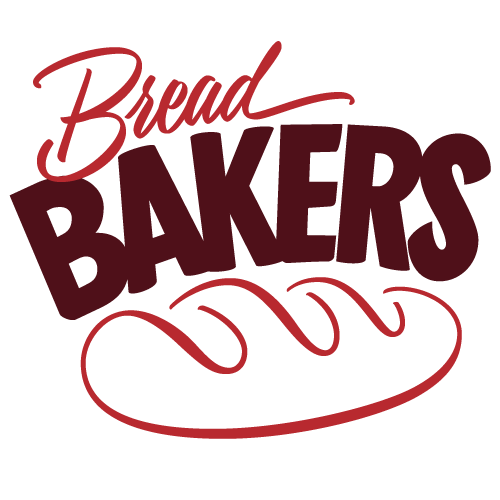 In a large mixing bowl, combine the flour, the larger pile of chopped pecans, brown sugar, cinnamon, baking powder, baking soda and salt. 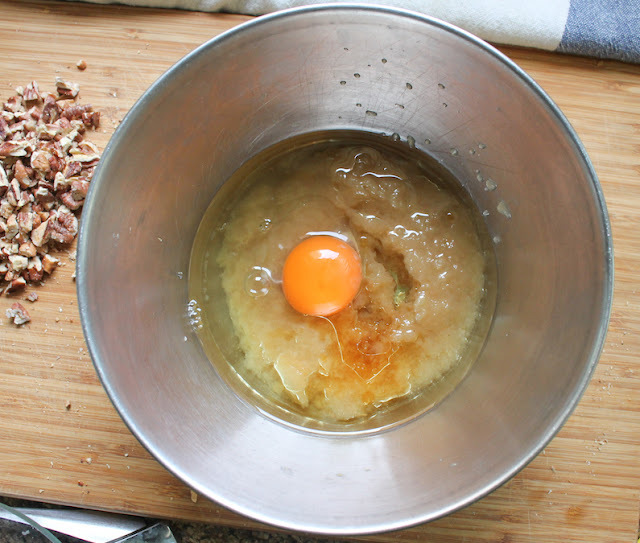 In another smaller mixing bowl, thoroughly whisk the oil, egg, applesauce and vanilla extract together. Divide the batter between the 12 muffin cups. Top with the reserved chopped pecans. Bake for about 20 minutes or until a toothpick comes out clean. Cool on a wire rack. 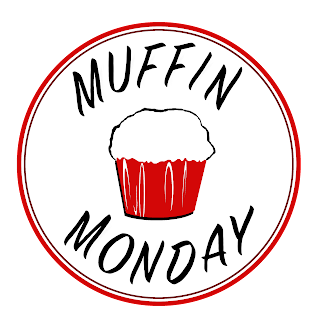 Many thanks to Karen from Karen’s Kitchen Stories for hosting this edition of Muffin Monday while I am on the road from the east coast to the west with my daughter. We are in New York state right now and are headed to Cleveland, Ohio this morning. As I mentioned in my last post, my Instagram feed is always kind of a weird mix of images, but for the next eight days, it's going to be filled with sights from our cross country trip. 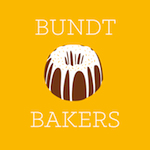 Do follow along! 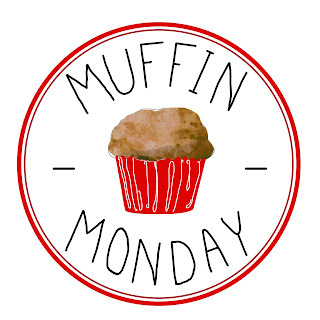 Meanwhile, make sure to check out all the other goodies my Muffin Monday friends are sharing today!